Cliff Bennett was one of the most under-rated R&B singers of his generation. His group, the Rebel Rousers, evolved during 1958 and 1959 taking their name from a Duane Eddy hit of the time. The band spent their first year or two as amateurs and the original, fully professional, line-up consisted of Bennett, Mick King, Frank Allen, Sid Phillips and Ricky Winters. Their first opportunity to record was in 1961 at Joe Meek's famous Holloway Road Studio. Although their records deserved a better fate, they remained uncharted and now have the status of collector's items. With no sign of a hit in sight, Frank Allen took the opportunity to join the Searchers who needed a replacement for Tony Jackson. However, Allen's place was soon filled by Bobby Thompson who abandoned his Liverpool group 'The Dominoes' shortly after their break from their lead singer 'King Size Taylor'. The band had to remain content with an arduous touring schedule which took full advantage of the German clubs in the Hamburg area. Their lack of hits went on until they secured the management of Brian Epstein and a little of the Beatles magic touch came their way. 'One Way Love', at last brought some of the atmosphere of their successful stage act to vinyl, but none of its immediate follow-ups did much at all. However, their final hit was the magnificent 'Got To Get You Into My Life' which was produced by Paul McCartney. 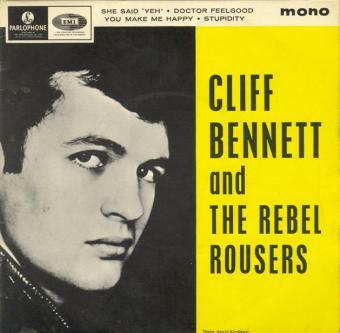 No further chart entries followed, but the band kept trying, even changing its name to the more contemporary, 'Cliff Bennett Band'. By this time several of the original members had fallen away and the group then included Mick Green and Frank Farley who had previously been members of the late Johnny Kidd's 'Pirates'. The EP illustrated on the right is a great copy to find because it contains tracks not found on any of Cliff's singles releases. Fortunately- although still not that easy to find, it is probably the most common of Cliff's few 45rpm EP releases. Cliff pressed on into the 1970s with new ideas, initially with the group, 'Toe Fat'. Sadly, Cliff was not able to find his way back to chart success and finally went into retirement. However, he has occasionally taken time out from his proper job to entertain us again on 1960s revivalist and nostalgia concerts. If you'd like to know more about Cliff and the early days of the Rebel Rousers, then just click here and be prepared for some very special photos!